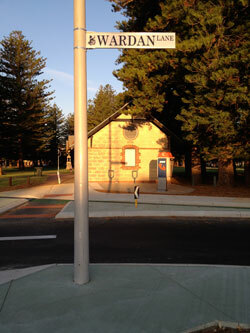 Wardan means ‘the sea’, so Wardan Boodjar means ‘sea country’ or the coast anywhere in the southwest. Wardan, or sea, is of great spiritual significance to the coastal Nyungar. 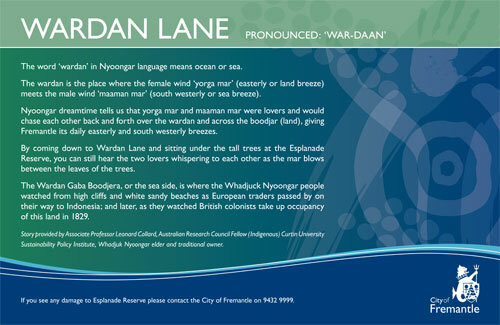 The words on the plaque shown below were written by Mr Leonard Collard, Nyungar Elder and Traditional Owner, and tell the story of the sea breeze and the easterly wind chasing each other across the coast. 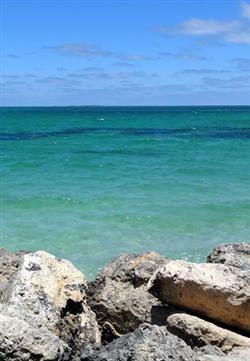 The plaque celebrates Nyungar cultural life on the coast and is located at Wardan Lane at Manjaree (Bathers Beach) in Fremantle. KJ: I just think that life would have been absolutely wonderful. I mean we’re talking about much smaller groups of people camping together and then sharing what they had, fishing when need be, swimming. I mean you can see the water. The colour of the water hasn’t changed much to how it would have been 200 years ago or over 200 years ago. So you’ve got Aboriginal people that enjoyed the sea life and everything that it had to offer and we’ve got so much water available to us in this area. So if it wasn’t saltwater it was fresh water and hunting and gathering and just kids playing… I can imagine kids playing around with either gumnuts and making little animals and sitting down in the dirt and then throwing skin balls at each other. LC: Looking at the footmarks of a bird and identifying what they are, pelican or a seagull. 1. Bates, Daisy. 1985. The Native Tribes of Western Australia. Isobel White (Ed.). Canberra: National Library of Australia, p. 222, In Western Australian Planning Commission. Indigenous Heritage. 2008. Accessed November 1, 2012. http://www.planning.wa.gov.au/dop_pub_pdf/Indigenous_Heritage.pdf. 3. Jacobs, K. Oral transcript, unpublished. Held by Laura Stocker, Curtin University & Len Collard, UWA.